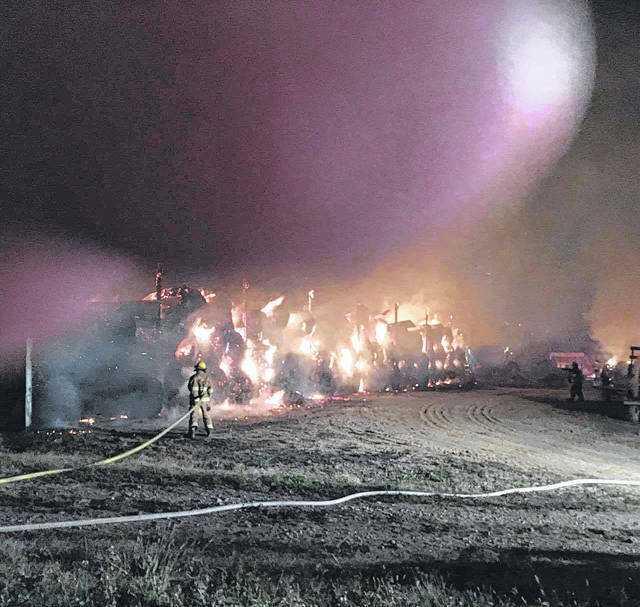 Crews from seven volunteer fire departments were called to a fire early Saturday morning at Holter’s Dairy Farm near Five Points. 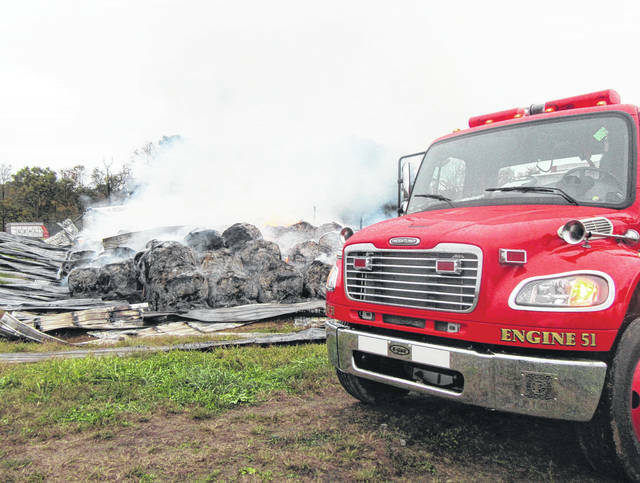 Chester Volunteer Fire Department remained on scene Saturday as the hay bales continued to burn. Firefighters from around the county were on scene throughout the early morning hours on Saturday. 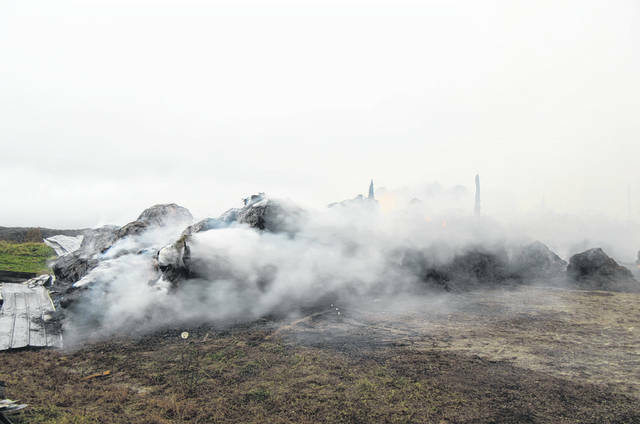 Hay bales continued to burn on Saturday morning after an early morning fire at Holter’s Dairy Farm. 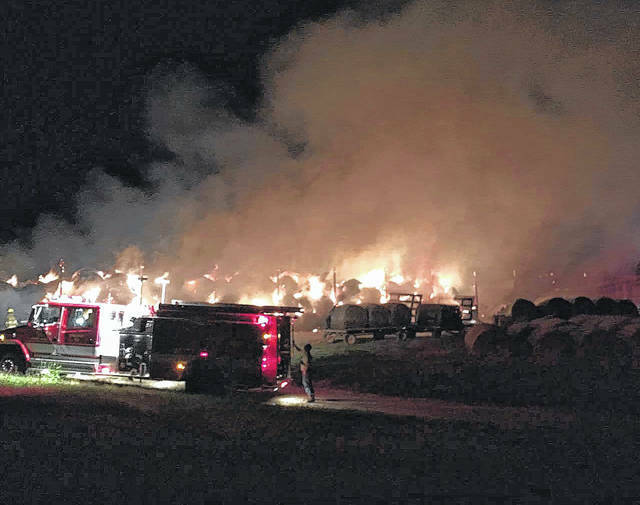 FIVE POINTS — Approximately 400 large round hay bales, two feed trucks and other equipment were lost or damaged in a seven-alarm fire early Saturday morning. Chester Volunteer Fire Department was alerted just after 2 a.m. to a fire at Holter’s Dairy Farm in the Five Points area, with mutual aid coming from Pomeroy, Middleport, Rutland, Tuppers Plains, Olive Twp. and Bashan Volunteer Fire Departments. Meigs EMS was also on scene in case of any injuries. Chester Chief Dave Edwards said that there were approximately 50 firefighters on the scene at one point during the night. When crews arrived on the scene a portion of the roof had collapsed onto the hay bales inside the 32-by-224 foot structure. Edwards explained that the crew pulled away the walls of the structure and cleared as much of the metal as was possible. 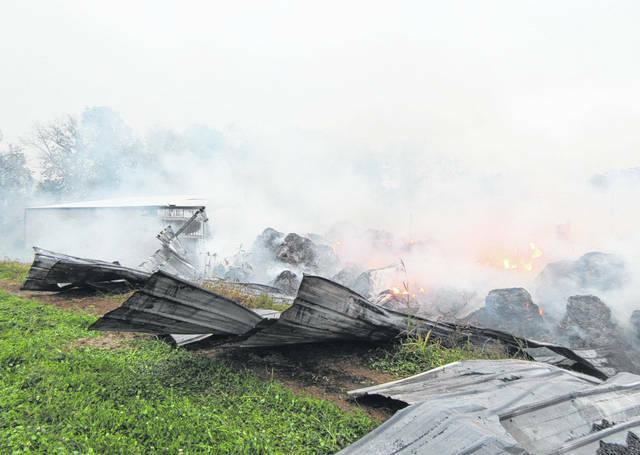 They sprayed water on the structure for a while, but hay bales are difficult to extinguish. The far end of the building where the equipment was located was able to be partially saved, with four bays remaining. The building held two feed trucks and a combine, both of which were destroyed, with damage to other equipment. Some equipment was able to be pulled from the building before being impacted by the fire, said Ed Holter. Edwards said it appears the fire may have started around the center of the building where the hay bales were located. He estimated that the bales were stacked approximately 12 feet high inside the building. While the cause is unknown, Edwards said the fire is not suspicious. There were no signs of any entry into the area and the location where the fire began would not have been easily accessible. Holter described the hay that was in the building as the “prime” hay for their milk cows this winter, the best hay they keep on the farm. Additionally, the two trucks were those that were used to transport feed from the storage locations to the cattle. Holter said Pomeroy was the first to arrive at the scene and helped to save the four bays on the far end of the building. “This was my first hay fire. It hit hard,” said Holter. Now, fire crews will remain to monitor the bales which remain burning to make sure that it does not spread beyond the current area. 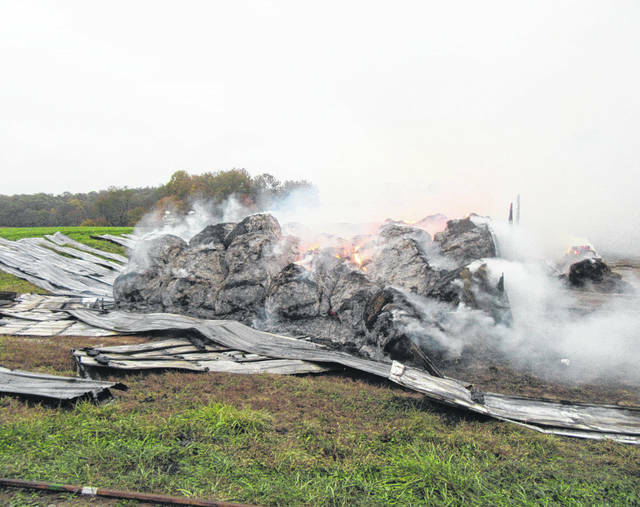 Edwards said that while there may be a smell of smoke and burning hay, it is not toxic. An insurance company representative was also on the scene soon after daybreak on Saturday morning to assess the situation. Edwards and Assistant Chief Roy Lee Bailey praised the work of the firefighters on the scene. The other departments are always there to help when the call comes, noted Edwards. “It is a brotherhood. They are there to offer support when needed,” said Edwards. “It’s a good family to be part of,” added Bailey. “It takes a special breed of person to be a volunteer firefighter,” said Edwards, adding that not everyone is willing to get up in the middle of the night when the tones go off. McDonald’s of Pomeroy provided the firefighters with food, coffee and tea during the night as they worked to contain the fire.